The John F. Germany Public Library in Tampa, Florida holds one of the largest genealogical collections in the southeast United States. I visit often and have always found the staff to be professional and helpful. Last month, my visit there saddened me. I planned to drop off some donated books and as it was thundering, decided to park in the adjoining parking garage. It was mid-day and the lot was just about filled. I thought I was lucky to find one of the few remaining spots on the top floor. I took the elevator to the tube that joins the garage with the library. When I approached the library doors I was shocked to find them boarded up. I guessed that the facility was being renovated. I walked a level down and then half way around the block to enter from the front. Stopping at the information desk, I asked for the acquisition clerk who was expecting me. “I’ll have to take you up because the elevator needs a key for that floor,” was the response. I thought that was odd but with security as it is these days, I wasn’t too surprised. On the way up I chatted with the staff member about the reason for my donation. When we arrived on the 4th floor, she accompanied me to another information desk. I turned over the materials and then stated I was going to spend the next hour in the Genealogy Department doing some research. Both staff members looked at each other and one finally responded, “This is the Genealogy Department.” Now I was terribly confused. I’ve been visiting this library for over 40 years and the Genealogy Department has always been in the annex and not in the main building. Evidently, in June, with little notice, the City of Tampa who owned the annex decided that the library must vacate the building. The Genealogy Department was relocated to smaller quarters on the 4th floor of the main building. That floor once held the Administration Department which is why the elevator only stopped there with a special access key. I understand progress but I’m dismayed that the City decided to relocate this genealogical gem because THEY’RE SELLING THE PROPERTY TO BUILD APARTMENTS. Now if housing was in such a shortage in the Tampa Bay area I could perhaps see the reasoning for the decision but as it is, there is much vacant land adjacent to downtown Tampa just a few blocks away that can be used for apartments. In the past few years, the City has relocated thousands of people as they’ve emptied out public housing high rises. They haven’t even demolished many of those vacant structures that are to be rebuilt for mixed usage someday. Obviously, the City’s priorities are not the same as mine. Progress is important but not at the expense of the past. The library staff has done a wonderful job on short notice to accommodate the space shortage. 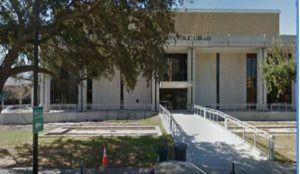 Kudos to the library staff; Shame on the City of Tampa’s decision. On the plane returning home from New Mexico, I sat next to a woman who had traced her paternal grandfather’s side back to the 1200’s in a Spanish village thanks to the church records and her ability to decipher old handwriting. She mentioned that she had found several deeds belonging to her great grandparents but could not locate the residences as the numbering system had changed in the past 100 years. Lucky for her, she met an elderly man who remembered the family and understood the new address system so she was able to identify where her grandfather and great grandfather were born. Taking into account address changes is an important point to remember as what you’re looking at might not be what you think it was. There are two websites available to help with situations like this. Whatwasthere.com is a site using Google Street View with uploaded photos of what the area looked like from previous time periods. You can assist this project by uploading old photos you may have that show the area in the past. Historypin.com is another site where you can place a pin on a Google map and upload a photo of what the area formerly looked like. Your old homestead just might be waiting for you to discover! Originally published on genealogyatheart.blogspot.com on 14 Sep 2016. My two most favorite locations to research are the Family History Library in Salt Lake City and the National Archives (NARA) in DC. Actually, NARA is by far the archive that I hold dearest to my heart as it’s the place where I am able to hold in my hands documents that my ancestors held years before. It’s a connection like no other! It was my final day in the Capitol and as I was headed to the airport in late afternoon, I had with my my suitcase. My sister-in-law had dropped me off at the commuter station close to her home at 9 AM and it was a straight line to the archive. The building isn’t crooked – I was after being on the road for several days! This view is of the researcher’s entrance – it’s around the side of the building from where the public enter to view the exhibits. Think National Treasure’s entrance. Going through security was not a problem and the guards pleasantly directed me to the locker room. For a quarter I could get a large locker to place my suitcase and purse. I hadn’t taken off the Kindle’s sleeve so I was sent back to place it with the rest of my belongings. The Kindle and/or a laptop is permissible but cannot have the cases with them. I also took with my my handy dandy plastic Baggie of goodies. I was prepared and had viewed the Powerpoint presentation at home prior to my trip. The ppt had been updated the week before, however, so I was required to take a few moments to read it. You can check out Researcher Presentation here. As with the Library of Congress, researchers must obtain a Research Card. You cannot preregister but there was no wait and within minutes I was on my way. The card you receive is free and valid for 1 year. Make sure you have a drivers license or passport with you! I was directed to a desk where the kind ladies helped me complete the pull request paperwork. Since I had already checked out their holdings I knew exactly what I wanted to get. I highly advise you to do the legwork at home and save time while there. It’s amazing how quickly time flies when you’re into the documents! The document pull requests must be turned in by the time deadlines or you miss that window. The pull times are 10, 11, 1, 2 and 3. I had already missed the 10 AM – when they open – as I had to get my Research Card. No worries, I was ready for the 11 AM pull. In the meantime, staff directed me to the microfilm room and I was happily viewing Postmaster Records from the late 1800s on several family members. I was able to save what I found to my thumb drive but you have to put money on your card. A staff member helped me and I decided it was best to use my charge card to guesstimate how much I would spend. I wasn’t sure if the records I was requesting from the pulls were what I wanted and I didn’t want to put more money on the card than needed as I wasn’t planning on being back soon and you can’t get a refund once money is placed. The staff member suggested $5.00 and as it turned out, he was exactly on the money! By noon I was on another floor asking at the desk if my items had been pulled. They hadn’t yet so I sat at a table and waited. It was a Thursday midday in July and the place was hopping! Every table in the room was taken. The adjacent room was almost empty but those tables were reserved for Congressmen so the remaining researchers had to share space. A kind researcher had noticed me downstairs earlier and asked me if I had found everything. I told him that my pull hadn’t come through yet. He suggested that I ask the staff member in another room as he found his request there. Sure enough, there was my goodies! I’m not going to bore you with the process but this is government so you’ve got to sign and sign again and make sure you’re signing in the right place on the right color paper. Don’t worry – the staff is patient and kind and will help you if you forget what you learned in the ppt. When I come back I plan on bringing my husband to expedite the process. I sat in awe and read the War of 1812 pension petition of my 3 x’s great grandmother Mary “Polly” Dennis Hodge Adams Elder Search. You read that correctly – she was married four times, outliving 3 of the husbands. Her first husband, John Hodge, went off to the War of 1812 leaving her 8 months pregnant with twins in the wilds of Ohio. She survived the childrens’ births, he did not. I’m descended from her second husband, Edward Adams. Polly couldn’t write, as evidenced from her X mark. One of her sons and daughters from her marriage to Edward accompanied her and signed the pension request. I wanted a copy so I went back to the staff member where I had obtained the record and he helped me set up the document on the printer. They use blue paper so as to make sure that no one is walking out with an original. I had put money on the card in the microfilm room so it was quick to make the copies. I signed the document back in and then went through the process with the other two documents, one at a time. I got teary eyed when I read the Civil War record of my husband’s 2nd great grandfather, Samuel Samuelson, who was the first of our surname. I knew he had sustained an injury but I didn’t know he had become a POW and was traded back to the Union, only to go on and fight another day. Wow. The last document was another one of my husband’s great grandfathers, John Anderson Long, who had also had a lengthy enlistment in the Union. He had fled Tennessee in the 1830’s as his anti-slavery stance had gotten him in serious trouble. He eventually settled in northern Indiana and that’s where he enlisted when the war began. I hadn’t known he was a teamster. The documents contained his medical history – he had once had pneumonia but recovered. All I was allowed to keep out was my locker key and Research Card. 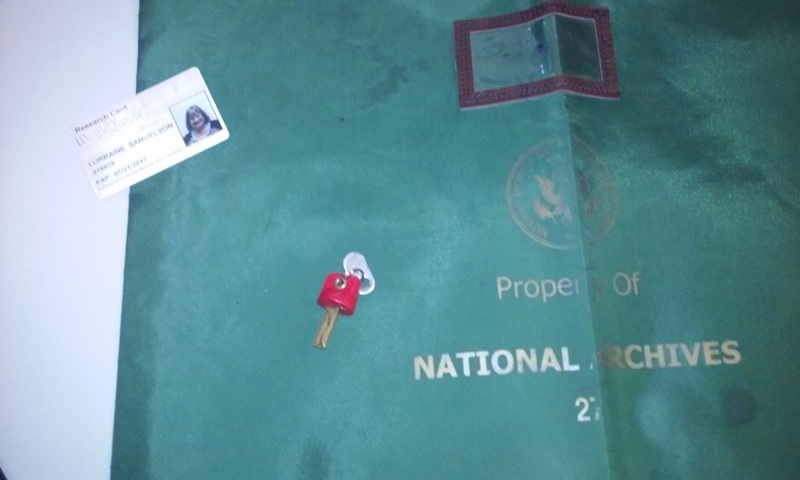 I then took these items to the guard desk who cleared me to leave the room. I gathered my belongings and ironically, got a call from my son. He was in the process of getting security clearance for his job and he had called to vent that the security company had not been able to verify his employment from 3 years ago at a local hardware store. I had to laugh – here I was holding documents from the 1840’s through 60’s and there’s no records from 3 years ago locally. I understand how it happened – the store was sold and the new owners didn’t have the old owner’s records. Son had a W-2 but the company wouldn’t take it because they said anyone could make one of those up. I guess they could but I don’t think like that. I suggested he track down the old owner and ask him for verification which he did. After the phone call I proceeded to the exit, which is the same place as the entrance. The guard opened the bag and returned my items to me. They had locked my suitcase upon entering the building and asked if I wanted it unlocked. It was a carryon and I didn’t need anything in it so I opted to leave the lock on. I did complete a comment card – I was so impressed with the staff’s professionalism, especially after the lackadaisical attitude of the Library of Congress employees, I had to let the top brass know. I’m hoping that next summer, I can take the week long class at NARA in July and spend more time. I’m already making a list of who I want to research. Originally published on genealogyatheart.blogspot.com on 10 Sep 2016. Recently I had the opportunity to research at the Daughter’s of the American Revolution (DAR) Library in Washington, DC. I was attending an educational conference and at its conclusion, had an afternoon free so a colleague who is a DAR and I decided to join forces on a research trip. Since we didn’t have much time we took a cab from our hotel. 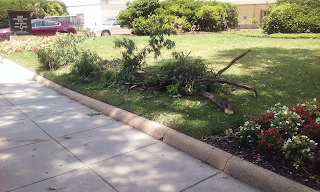 There had been a wicked storm the prior evening so there were tree limbs littering the street and work crews trying to open closed roads. The taxi driver got us as close as possible due to this situation. I had already checked out of the hotel so I had my suitcase with me when I arrived. I know the DAR has gotten a lot of flack over the years for some of their policies but I must say that these were the nicest people I had met in DC on this trip so far. The guard said to put my suitcase in a corner and he’d watch it for me. We got a visitor’s sticker and were directed to the library. My colleague and I split up and I had two objectives; the first to find if John Duer was still open for new members and the second, what was the problem with Wilson Williams. I always planned on joining the DAR when I retired and I didn’t want to submit paperwork on John Duer if the line was closed. I was assured he was open. My concern with Wilson was due to a family member who had decided to join the DAR but was told she couldn’t because of paperwork problems for Wilson. I had helped with the research on Wilson and I wanted to know what was wrong. Did someone find out, gasp, he had aided the Loyalists? Was there another Wilson that we had mistakenly followed? The Librarian checked and found no problem with Wilson. He believed the family member misunderstood what she was told – there are too many people who joined DAR with the short form for Wilson and if she would like to become a member, she would have to complete a long form. No worries there! I headed for the stacks and found a few books that gave me some leads on my Thomas Duer connection. I also checked out surnames for the Kinship Determination Paper I was submitting for certification just in case there was something somewhere I had missed. Nope, had all of the derivatives and not surprisingly, no primary info to be found there. After about an hour I texted my colleague who was wandering in the museum. I joined her and loved the displays. Reminded me of the historical museum in Morristown, New Jersey. As we left she asked me if I had taken any photos of books with my phone. “Yes,” I replied, “a few.” I inquired as to why she asked. Evidently, that was not permitted. She had whipped out her phone to take a photo of a map and was informed by the Librarian that she owed $10.00. She didn’t have a ten so she gave them a $20. and told them the rest was a donation. She’s a much better person than me, for sure! I would not have handled it like that. I questioned her as to where there was a sign posted that photo’s weren’t permitted. She said there hadn’t been any and that a patron overheard and also questioned the policy. The Librarian responded that it had always been the policy. When I came home I searched the DAR website and didn’t find anything regarding a no using your camera policy but be warned if you visit – your photo might cost you a whole lot more than a copy would! 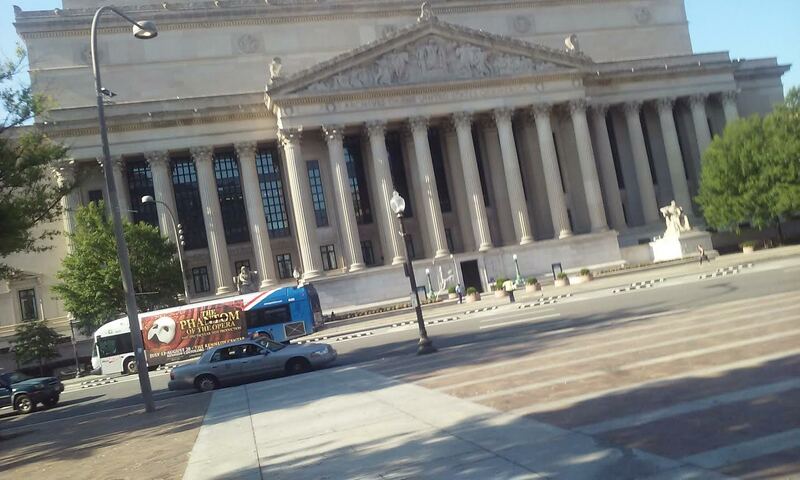 Next time I’ll write about behind the scenes at the National Archives. Originally published on genealogyatheart.blogspot.com on 8 Sep 2016. 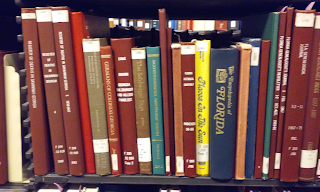 I had always wanted to go on the other side – the nontourist side – of the Library of Congress to research. On a Saturday afternoon in July I parked my rental car in a great (well, not really, more about that later) spot behind the Madison Building. The library is housed in more than one building so go online to check out their holdings and where they are located before you visit. Although the purpose of the library is to be used by Congress, adult researchers may access the holdings by obtaining a Reader Card. You can complete most of the information online ahead of your trip to save time – just follow this Pre Register link. Be forwarned that children may not obtain entry to the holdings. A high school student might but there is a process involved so make sure you follow the directions and have secured the necessary paperwork. Gotta love the government! After going through security I was directed to the left hallway by the guards to obtain my reader’s card. I presented my driver’s license but a passport will also work. The bored clerk at the desk checked that I had pre-registered and directed me to sit around the corner. There were three individuals ahead of me. Shortly, I was called by another bored employee who had earbuds in and was watching a video on her phone. She directed me, with no eye contact, to sit in her area so a quick photo could be taken. My card was ready quickly and I was on my way. I originally had two goals – visit the genealogy section to just “read” the shelves and find a rare book written by a family member. My plans changed, however, after visiting Pennsylvania as I found a copy of the “rare” book just sitting on a library shelf. Funny how one repository considers something rare and unique and another does not. The genealogy section is housed in the Jefferson Building which is across the street from the Madison Building. Researchers enter below the tourist entrance. After once again going through security and having to show my Reader’s Card I was directed to the coat room where I checked my belongings. I took only my plastic Baggie and Kindle. I was then directed down a long winding hallway and eventually reached the elevator. I was headed to the humanities area and once I arrived, I had to display my Reader’s Card to another guard and sign in. The guard displayed an attitude as if I was bothering her – I guess I had disturbed her from reading. I entered a mid sized room and asked the Librarian where I might find the genealogy section. His response, “The genealogist isn’t here today.” I told him that was fine, I didn’t need to consult with a genealogist. I just needed direction to where the materials were housed. He told me to follow him and we entered the gorgeous reading room and veered to the right. The genealogy section was hidden behind a door and looked like nothing had been added in years. Down a rickety plywood ramp the Librarian kindly asked what particular area I was researching. I told him I had several – Florida, Maryland, Pennsylvania, Ohio, Indiana and New Jersey. He wasn’t familiar with the layout and began to search the shelves. I told him I would be fine so he left. I wasn’t expecting much so I wasn’t disappointed. 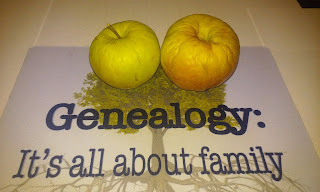 It was everything I had previously read about the genealogy holdings. I confirmed that there are many more resources in my own back yard then what was housed at the LOC. 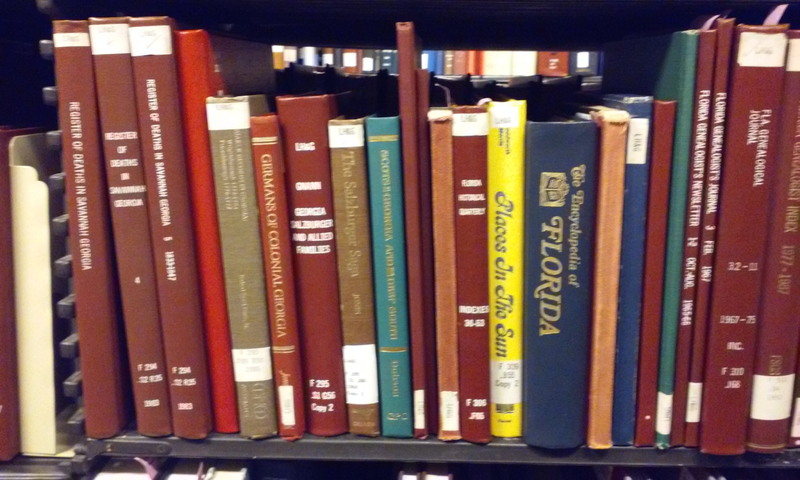 This is one of only 2 shelves of Florida books. I’m going to keep my political opinions to myself but am going to state that if this is where Congress goes to get info – well, it explains a lot about Congress. I found absolutely nothing . Since I had gone to all the trouble of getting a Readers Card and driving through downtown DC I figured I should at least spend a bit of time reading. I left the genealogy section and wandered through the humanities section. Found a nice book on Greek philosophy so I sat and read a chapter. I think I must be in a zillion tourist photos. It is very distracting trying to read when lights from cameras are going off constantly. It was an interesting experience. Guess I could equate it to being a fish in a fishbowl. Maybe because it was a Saturday there weren’t many Readers in the room – I counted three besides me. Getting out of the LOC is the same as getting in. When I left the humanities area I was directed to again go through security and sign out by the guard who had changed since I entered. This individual was much more pleasant. Back up the elevator, down the winding hallway and to the coat room to retrieve my belongings. Those folks in the coat room are busy and nice! One more check through security and the walk back to the rental car. So, about that awesome parking space – I somehow missed the sign that said I had to have a sticker permit to park where I did. I got a parking ticket for not following directions of the sign I didn’t see. I have a long history of family members thrown out of lots of different countries (and fleeing several states) for their inability to follow directions and thus, getting into trouble. I’m thinking that maybe, like me, it’s not so much they don’t follow directions as not see the directions. Just a thought. My husband’s several times great step uncle Leonard Harbaugh had been the builder overseeing the building of Congress and the White House. When I told my husband about the ticket he reminded me none of his family members ever drive in the city and that’s why they don’t get tickets. Even so, it was a wonderful parking place and worth the ticket fine as it was close. I would have paid more if I had found a garage. Now I’m not recommending you get a ticket if you go but all things considered, it was okay with me. Next time I’ll discuss researching at the DAR Library. Originally published on genealogyatheart.blogspot.com on 4 Sept 2016. It was the dawning of my last day of my research trip to Pennsylvania and was hoping for a miracle to find the burial location with a date for my husband’s 3 x’s great grandfather. I also wanted to confirm church records of where another of his 3 x’s great grandfather’s was buried in a second cemetery. The cemetery had no record of that burial but it was listed in church records. After a quick breakfast and checking out of the hotel I was on to Antietam Cemetery. I drove the rental car as close to the family plots as possible. I hadn’t mixed the bleach in the water to clean the stones as per the Reverend’s instructions as I was afraid I’d spill it in the car and wreck the carpeting. The Walmart in Waynesboro carries bleach tablets. We don’t have those in my Walmart! They were perfect as I only had to pop one in the spray bottle and then add water. No worries about spilling a bottle of bleach. Since it wasn’t yet 8 AM the dew was still covering the ground. My sneakers were soaked quickly but I trudged on, located the graves and sprayed away. Once I had sprayed the entire family’s stones I went back to the first grave and gently rubbed the lichen off with the scrub brush. MAGIC! I resprayed bleach solution and moved down to the next stone. After the second brushing I poured clean water over the stone. I was now wet, hot and filthy but happy – I could finally read all the stones. Well, the parts that were above ground level. As the Reverend had mentioned yesterday, the area was prone to sinking and one stone in particular had really gone down quite a lot. I suspect the Revered was correct that if there were stones for my husband’s missing great grandparents they had sunk. I believe there had been stones as the family has a notorious bread crumb trail of stones going back to the 1600’s in what is now Germany. I would find it odd that this was the only couple that did not have stones, especially since the stone for their son was quite large. Back in the car I drove to Green Hill Cemetery. I marched to the stone I had found the previous day and sprayed away. Even after speaking with the cemetery’s director the area still had not been cleaned. I also sprayed the stones on either side to see if maybe one did belong to the great grandfather as church records stated. Removing the dirt layer certainly helped the readability but the stone to the right was completely worn. Interestingly, it was of the same type of marble as the family member’s stone and none others surrounding were. The stone was smaller and I am now thinking it must be the stone for the infant that had died. Perhaps both children had died at the same time and the older sibling got the bigger stone. It didn’t make sense that the grandfather would have a tiny stone and the grandson a larger one. On the smooth stone I placed typing paper that the sweet girl in the hotel had given me and rubbed with a black kindergarten crayon to see if anything would be revealed – nothing. My mind wanted to see an outline of a lamb in the middle of the stone but I wasn’t sure if this was reality or not. It was no clearer on the rubbing than in a photo. Taking the scrub brush I decided to continue to search for the missing grandfather’s stone. I located it in the same row but on the left side of the middle. I quickly sprayed, scrubbed and washed. No doubt about it – this was the stone of the man mentioned in the church records that was not included on the cemetery’s derivative list. I’m not sure why the stone was located where it was. Church records show that the stone was originally next to the grandson but that’s not the case. Either the stones were mixed when they were relocated from Old Union or the church records are wrong. Some mysteries just won’t be solved. I was so glad to have returned and searched again with better tools. I could leave the area with more knowledge than I had which was a good thing! I was headed to Virginia to spend the evening with my sister-in-law and decided to take the scenic route through Harbaugh Valley. I’ve seen the pictures online and read about the area for nearly 40 years so this was especially important to me. The GPS directions made me laugh – I was headed back to the hotel where I had stayed. Ironically, I was staying just a short distance from the Reverend Henry Harbaugh’s old homestead. We have a copy of his poetry book that had been handed down for generations. I have also chuckled at his family history, of which we also have a copy. Written in 1856 his was the first of several family genealogies written. Now I’m not criticizing here as I think he did a wonderful job given the time it was published. He couldn’t email, phone or just fly into an area like I had just done to do his research. What I find humorous in a dark sense is that he often ended a biography with “He’s dead.” No, you think? The sermons he left weren’t so succinct so I’m not sure why he used such brevity often in his book. I located Harbaugh Road quickly and parked in the Harbaugh church lot. The cemetery behind the church is still used but it wasn’t as well maintained as I had envisioned. Many of the older stones were totally unreadable. There was no point in using the bleach – these stones were out in the middle of a corn field and not subjected to the lichen that covered the stones in the cemeteries on the other side of town. The church was locked so I could not go in. I was disappointed not to find the stone for the missing grandmother. A marker outside of the church reminded me of the Reverend Henry’s brevity; it mentioned that a marker for the family home was nearby but didn’t give directions. I brought up my family tree on my phone to see if I had any coordinates. Nope. I drove down Harbaugh Road and came to it’s end. There was a subdivision now and not farmland. I turned around and went back the way I had come, passing the church and turning left at the end of the road. A sign that denoted the Maryland state line was displayed. I crossed the line and stopped at a vegetable market. None of the employees or customers had ever heard of Reverend Harbaugh but they did know there was a church up the street. Ironically, one of the employees was related to the Harbaughs but he didn’t know it until I informed him. He didn’t care much, either. I drove back into Pennsylvania and stopped at an antique store located up the road. The owner said she had never heard of the Reverend Harbaugh, either, but she knew there was a road and church and whenever an event was held at the church she got lots of business as people stopped to use her restroom. She was somewhat interested in history so I enlightened her on the land that was across from her property. She told me that the building where the store was located was once the train station for the area. This must have been the place where the Reverend Harbaugh boarded for his trip to Ohio. He had to learn English as the family spoke German at home and he learned while traveling. His parents missed him terribly and when he returned and after he became a minister, built the church to keep him in the area. As a parent of adult children, I so relate to that! This same station was possibly where my husband’s family had left the area when they relocated to northern Indiana. From the diary of their maternal aunt I knew the day and time the family had arrived in 1869 but I didn’t know the departure schedule. It would be interesting to research further but it was now afternoon and I had to be on my way. It was a fitting way to end the trip, leaving the area, from the same location they likely had. Next time I’ll write about my adventures in Washington, DC. Originally published on genealogyatheart.blogspot.com on 31 Aug 2016. I was on the way to visit the home of a minister who had old cemetery records from a previous church that was no longer in existence. I’m a farmer’s daughter so driving down country roads and acclimating myself to finding directions isn’t that big of a deal to me. I was pushing the speed limit, though, as the Reverend had not wanted to meet with me today as he had other plans and I didn’t want to hold him up. In about 20 minutes I whizzed past the turnoff. I call it a turnoff because it wasn’t a named street. It was a gravel drive that appeared to belong to one family but after making a 3 point turn I realized that several families lived on this lane. An elderly gentleman flagged me and I rolled down the passenger side window and asked him if he was the Reverend. He asked why I wanted to know (so clearly, he wasn’t or if he was, he had a serious case of forgetfulness.) I told the man I had an appointment with the Reverend. He looked skeptical and pointed down the road, informing me that the Reverend lived behind the barn. I drove off and was soon flagged down by an older woman who looked like she stepped out of the 1800’s. I again rolled the passenger side window down and told her I was meeting with the Reverend. She shook her head like she didn’t believe me and pointed behind her. The lane curved slightly between her home and the large barn. I came to the end of the lane and parked; I knew this was the Reverend’s place as I recognized the truck from that morning when I had been in the cemetery. There was no doorbell so I knocked firmly on the door. No answer. I knocked again. No answer. It dawned on me I should go to the back door and not the front door. I walked around the house and the Reverend was coming in from the field. I gave him a perky hello but he was not too keen to see me. He immediately said, “My wife looked and didn’t find the people you wrote in your note. They aren’t buried there.” I told him I believed his wife had done a great job but I wanted to see who was buried next to the Pentz’s as I had found the people I was looking for in the cemetery that morning. He looked surprised. I whipped out my phone and showed him the tombstones. He shook his head and invited me in. The Mrs. Reverend and daughter were baking and it smelled wonderful! I said hello and mentioned how good it smelled. Neither responded. I followed the Reverend through the dining room and into the living room. He told me to sit at a table and he would bring the maps and book. We looked through the book and found no one named Pentz. He asked me if I was sure that I had been in his cemetery and not some other cemetery. I was not only sure, I produced the Find-a-Grave page for the people I was looking for. I pointed out the background that clearly showed the other church so it had to be his cemetery. He was quietly pondering how this could be when he asked me to point on the map he produced where I had found the graves. He asked me if the plots were near the apple trees. I hadn’t noticed apple trees. I told him it was close to the smaller, fenced cemetery, three rows in from there. He replied, “Well, that explains it. I don’t have records for that part of the cemetery. That’s the old cemetery. My records start in 1897.” The tombstones I had photographed were from prior to that. I asked where I could find the older records. He said there weren’t any. Huh? Evidently Price’s Church kept no records or if they ever did, they were long gone. He said they all knew where everyone was buried or married to so they didn’t need records. Great! So I would not be finding a marriage record for my Ancestor 1’s sister, either. The Reverend could see I was deeply disappointed and asked me why it was so important that I find this information. I told him I was a teacher and was going to be retiring soon and was planning a second career as a genealogist. I needed the records for a paper I was writing to become certified. He informed me his daughter was also a teacher. He thought for a moment and said he had been told by elders that there were no burial spaces remaining in that older section. It was possible that the stones for the people I were seeking were sunken, which would have explained why the area looked depressed to me. He said there had been several problems with sunken stones in that area. He suggested I go back and look carefully at the ground to see if any remaining part of a monument might be visible. I mentioned that the stones had deteriorated a great deal since the picture had been taken and placed on Find-a-Grave. He suggested I spray the stones with bleach water and lightly brush the lichen off. I thanked him for his time, said good-bye to the family, and was on my way. I stopped back at the cemetery and kicked with my foot into the ground to see if I could feel a stone. Nothing but the area was clearly sunken. When I had visited in the morning I thought that the stone was on a pedestal but that’s not the case. Upon closer inspection, and moving the dead grass off the base, I discovered that the death date is below the ground level. I would return with bleach and a brush first thing the next morning! I made one last walk through of the stacks to make sure I hadn’t missed anything from the visit yesterday. The volunteer genealogist still hadn’t come in and there was no telling when he would. There were different librarians on duty so I asked them where I could find the Union Cemetery records. Checking the database I wasn’t surprised to get the same response as yesterday – we don’t have them. I signed on to a computer and finished searching the newspaper archives that had been digitally uploaded. Nothing discovered. I asked where I could find the newspaper that had been mentioned on the pedigree chart in the museum. They had no idea. I was calling it a night. Hopefully, I’d find something tomorrow. No will at the courthouse – only the index of the will; the county archivist will be notified to be on the look out but I did search the entire box and it wasn’t misfiled there. Found several deeds and one mortgage – not all were for my family but the ones that were I found helpful. Found one tombstone but still needed to know where several other family members were buried. If time permitted, wanted to find church records for an unknown church once located between Waynesboro and Gettysburg. Nothing like being precise! 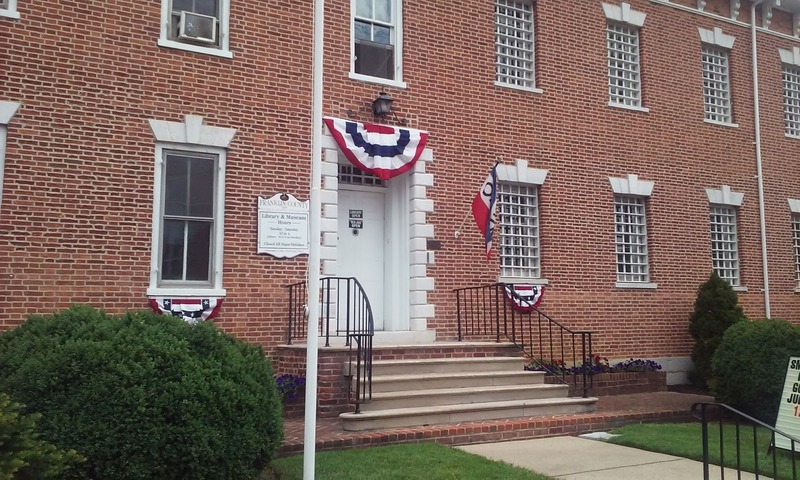 I drove back from Chambersburg to Waynesboro and parked in front of the Historical Museum. It’s located on Main Street in an old house. I almost had a heart attack though; it was 12:50 and the sign said it closed at 1. Omg! 10 minutes!? That’s not what the closing time said online. Maybe it was summer hours and the website hadn’t been updated. I quickly went inside. No one was on the first floor. I called out “Hello,” and heard a response from somewhere upstairs so I walked up. A kind older gentleman was in the library. It was about the same size as the Franklin County Historical Society – two rooms floor to ceiling books. I told the gentleman how glad I was that I had made it before he closed. He said he had plenty of time so not to worry about the sign. Thank goodness for passionate historians! I told him what I was looking for – I had listed the information on Evernote on my Kindle during my lunch break. The Society’s collection contained mostly genealogies so we began looking for the surnames of those I was interested in. We found two – they weren’t the direct lines I was interested in but they were cousins. I knew this because I always research extended family members; I can’t tell you how many times I’ve found valuable information that way! I am definitely a FAN Club member. At the bottom of a Family Group Sheet was a note that an obit for a family member had been found in a newspaper I had never heard of and the date was given. This was the family that I had found in the second cemetery that morning. Oh happy days! Maybe it would lead me to where their father was buried and a firm death date. The gentlemen told me, though, that he doubted any copies of that newspaper, which had been a county newspaper, still existed. Of course there wasn’t a clipping of the obit in the Society’s file. I could still check with the two libraries to see if they had digitized records so at least it was a lead. At this point my cell rang – it was the Reverend who I had left a note for earlier in the day regarding seeing the cemetery records of his church’s cemetery. He told me that he had gone home, which is where the records are kept, and his wife had not found the individuals I had listed. I asked him if I could look myself. In hindsight, I realize this came across as crass but that wasn’t my intention. I wanted to look at who else may have been buried in proximity to the family I had found; I was not doubting that his wife had missed the names I sought. I could tell from his tone of voice he was not pleased. He said he had other plans for the day. I asked if he was available the following morning, my last available time I would be in the area. There was a long pause. I pressed on that I was a genealogist from Florida and that I would be willing to meet him anywhere and any time to see the records. He asked where I was and I told him. He said it would take me about a half hour to get to his home. I wrote down his address and told him I’d be there as soon as possible. Now I realize in hindsight this was really stupid on my part. I was going to someone’s home I didn’t know, alone, in a rural area I wasn’t familiar with and to people who didn’t want me there in the first place. At the time, though, it seemed like a great idea. I thanked the volunteer at the historical society and he asked where I was headed off to. I told him I was going to see the cemetery records. He had a hunch that my elusive parents may have been buried in Price’s Cemetery as many Church of the Brethren were buried there. I asked where it was located. Lo and behold – Price’s had changed names and is now called Antietam and surprise, surprise – it was the same cemetery where I had found the son buried in the Pentz family lot. I asked, by chance, did the gentleman know of the name of a Church of the Brethren denomination that once was between Waynesboro and Gettysburg. Sure, he did – it was Price’s Church. Bingo! Did he happen to know where the records were kept for Price’s Church? He suggested I ask the reverend I was going to visit as he was the minister of the church that had taken over when Price’s disbanded. Now I was on to something! Next time – I’ll talk about my unusual visit with the Reverend. Originally published on genealogyatheart.blogspot.com on 24 Aug 2016. I’ve been blogging about my recent research trip to Franklin County, Pennsylvania. My last post told about a cemetery where reinternments of the family I was researching were placed. I had discovered that the cemetery did not have original records from the first burial site – only derivatives – and that the records that that were available most likely were not accurate as one individual was mentioned in church records but not in the cemetery records. 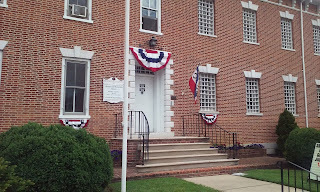 I was hoping to find the original cemetery records for Union Cemetery so I decided I would drive back to Chambersburg and check out the Franklin County Historical Museum and Library to see what information I could find. I had tried to make contact via email and phone several times in the past few months with this archive but no one ever returned my query regarding whether or not they had City Directories for Waynesboro from the mid to late 1800’s. On the way, I passed another cemetery and I recalled that the brother of the family I was researching was buried there. Hmmm, could this be the final resting place of the parents I was looking for? I pulled in and made a plan. The cemetery was small. Actually, there were two cemeteries adjacent to each other. The first was very tiny and had a chain link fence around it. It was close to a brick building that had no name but was too big to be an office. It was locked. The second cemetery started on the other side of the chain link and was being mowed by a woman on a riding lawn mower. She had on head phones so she couldn’t hear me. There was a second brick building that I assumed was a church. It, too, was locked. I could hear someone inside vacuuming. Besides me, there were only 2 vehicles in the parking lot – a truck with a window open and a car. I had a copy of the Find-A-Grave page for the family interred so I knew what I was looking for but it didn’t have coordinates. The family was not on Billion Graves. I walked to the woman mowing and she stopped to chat. She told me that the Reverend was in the church and I needed to speak with him for records. She informed me that she was responsible for mowing the larger cemetery and that the smaller, enclosed one was owned by a different church. She was not familiar with the markers as she was just hired to cut the grass. 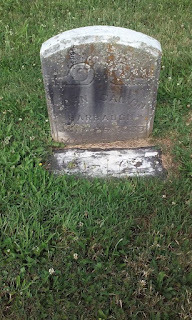 Looking at my Find-A-Grave picture, however, she pointed out that the stones I was looking for most likely were towards the road I had pulled off of as she could see the enclosed cemetery and the building in the background. Good point! I went back to the church and knocked again and again but the Reverend could not hear me. I decided to find the stones and using the hint in the background, quickly gained perspective and found the family. Some of the stones were unreadable. My goodness, have stones in this area deteriorated since the memorials were placed online! I took a lot of pictures. What I found most interesting were 2 things. First, the end stone had a family name of Pentz on a large marker. I have no idea how that family is related to the people buried there. There were no other Pentz’s in the row, either. Very weird! Next odd thing was the empty space that looked like it could hold 3 graves between the Pentz marker and the start of the family I was seeking. The area looked depressed – no stones – but sunken somewhat. Hmm. This was the former jail so the door is extremely heavy. No one around but I saw a sign that showed the library was upstairs. I was met by a wonderfully kind volunteer who had lived in the area her whole life. I love finding people like this! The library was very small – 2 rooms. She didn’t charge me for research, either, which I greatly appreciate. She suggested we look in a book of Franklin County Cemetery inscriptions that was written in the 1970’s. The people I was seeking weren’t listed. I wasn’t surprised, my people are always elusive. The volunteer was certain that the compiler had done a marvelous job and included everything she had seen. Perhaps, but it’s the unseen I needed. Like the unreadable grave stone in Green Hill or the possible sunken stones in the second cemetery where I had stopped. There was no voting records, city directories, educational records, or road orders. I guess no one had ever asked about road orders – the family had been wagon makers so I thought maybe they also were in charge of the roads. I have had that happen with another line on Long Island about the same time and thought I’d give it a shot. We looked at the donated genealogies and although there was some information on related lines, it was nothing new. Actually, it had been lifted from the text that had given me the missing sibling name I was trying to find at the cemetery. I was going in circles! She suggested I contact a volunteer librarian at the Chambersburg library who had once worked at the Alexander Hamilton Library for information about the possibility of Union Cemetery records being housed there but not noted in the holdings. She pointed out the window to the library next door. Awesome, wouldn’t have to move the car! Except, the library is closed for renovation and somehow the volunteer didn’t know that. Walked around the barricades (on the wrong side, of course) and saw the new temporary location address. Back to the car and gps! A few minutes later I arrived at the library. The lady I needed to see wasn’t there. Big shock, there! She wouldn’t be back for several days. I left her a note with my email address. I also asked for hers and emailed her when I returned home. She never responded. No one else there had any knowledge of the area’s history. Time for lunch! I had 2 half days left in the area and wanted to make the best use of what little there was left to see. Over lunch, I decided I would go back to Waynesboro and stop at their historical museum, visit any antique stores I might find open and go back to the library to see if the volunteer genealogist had shown up. I could accomplish all that in the afternoon and would just leave earlier than I had anticipated the following day. Little did I know what was about to happen!